How do we know where our journeys may ultimately take us? In this inspiring story of love and redemption, we travel to the heart of our spiritual nature, across lifetime and continents, to a place where nothing is as it appears to be. On the eve of the new Millennium, a suburban Washington, D. C., therapist finds herself on the opposite side of the globe in the midst of a life-altering ordeal. Six months before, a friend had made a curious request: “Will you come to China?” The friend was adopting a baby, an orphan from a rural village, and needed a companion for the trip. She had found herself answering ‘yes’ without hesitation. Now, miles from home and after an unexpected turn of events, she was once again answering ‘yes’ without hesitation, this time to the most important question of her life. As she struggles with the challenges before her, overcome by what she has witnessed, another story begins to unfold. Through dreams and flashbacks, she is taken on a journey to the mythic land of Ancient China, a world and time which parallels and illuminates the present in a strange and unforgettable way. The voice of a young Chinese woman emerges and begins to tell her own story of love and longing, She is about to become Empress and is herself on the threshold of a life-altering decision. The Empress bares a child whom the Emperor will seek to destroy; a child who could save them all and redeem the lost souls of her native land. The two stories weave a beautiful tapestry of love, longing and ultimate spiritual triumph played out over lifetimes and continents. Could the two lives be connected, could one life have led to another? 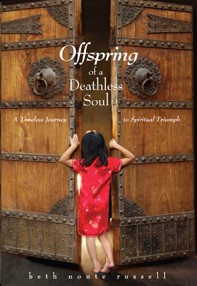 Offspring of a Deathless Soul offers the reader a new way of answering the questions, why do things happen as they do? Which leads to another questions: what would one do, if confronted with the question of a lifetime?